April 15, 2016 found the grotto doing some community outreach at the Fields-Penn House in Abingdon, VA for yet another Earth Day celebration. Working the table this year was Bill and Wendy Grose, Jason Lachniet, and by early afternoon, Clair, May, and Rosealie. By late afternoon and the conclusion of the day’s event we’d had several dozen people stop by to talk caves, share their experiences, and inquire about joining the grotto. In addition to spending a relaxing day of fellowship and outreach, Walker Mountain Grotto extends a welcome to our newest member, Brad. Brad and his girlfriend spent a long time talking about caving and ultimately, Brad joined us the following week at our monthly grotto meeting. Welcome, Brad! 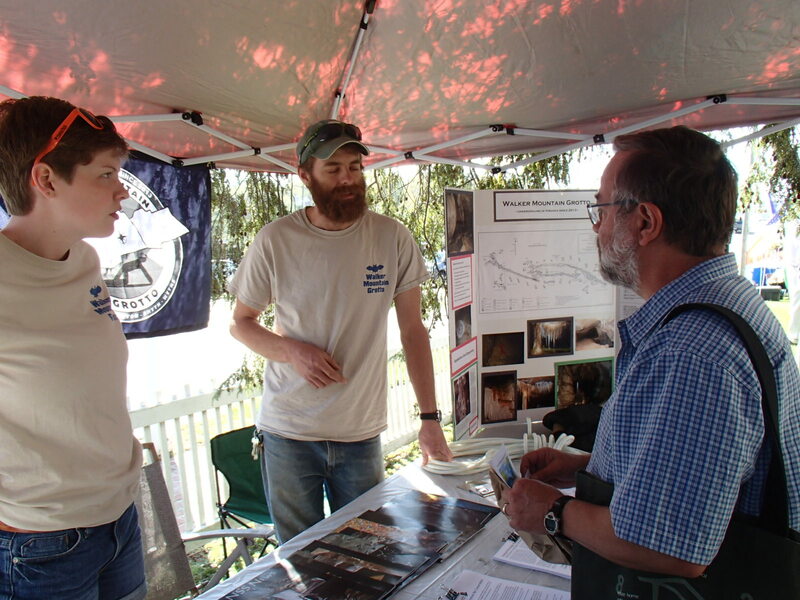 April 1-3, 2016 was The Upper Tennessee Karst Conservation Symposium hosted by the Nature Conservancy, with the support of the VA DCR at Natural Tunnel State Park. 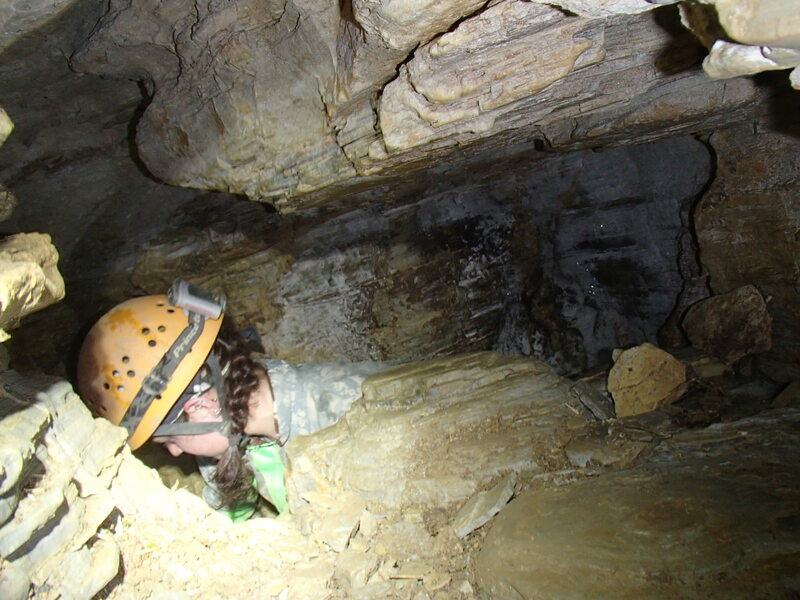 The stated goals of the symposium were to “highlight organizational roles and priorities and facilitate networking, regarding ongoing Upper Tennessee Karst conservation work and potential collaborative opportunities.” Over 30 cave-related and conservation-related agencies were invited. Representing Walker Mountain Grotto was grotto president (and ACC Director) Jason Lachniet and grotto treasurer Tanya McLaughlin. Jason presented a ground water mapping project he and others have been working on for some time. Unfortunately, Jason and Tanya could only stay for the day. The Appalachian Cave Conservancy held their quarterly Board meeting second day of the symposium while the majority of the symposium attendees visited the Cedars State Natural Area Preserve. Grotto member and ACC Director Bill Grose attended that day. Following the ACC meeting, the ACC led a trip into Gilley Cave for interested symposium attendees. While not a grotto trip, it bears mention. Wil Orndorff gave an excellent running commentary of the geology and biota of Gilley Cave as we descended to the stream level and the hoops. One highlight was a viable explanation of the hoops origins, put forth by Mike Ficco and Wil Orndorff – the remains of stromatolites (minus the domes, of course.) Mike and Wil pointed out two examples embedded on the wall of the stream passage that did have relatively complete domes to support their thesis. Although I hadn’t planned on caving that day, and ended up bowing to peer pressure I had an excellent time caving with old and new friends, learned a lot, and shared excellent fellowship. 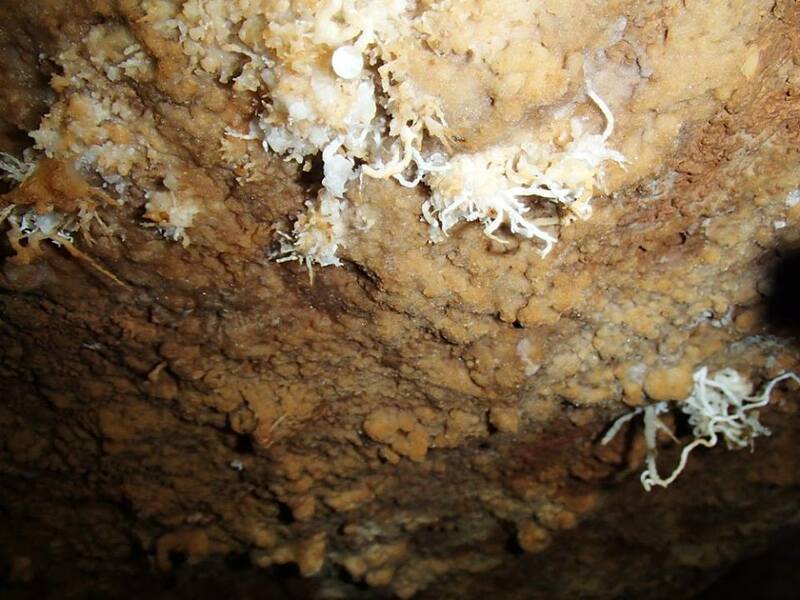 Being a resident of Wytheville, Log Cabin Cave has long been an interest of mine. I’ve had a fair number of meals, and more than a fair number of drinks at the restaurant, and there’s just something intriguing knowing there’s alleged to be a cave somewhere under your table. 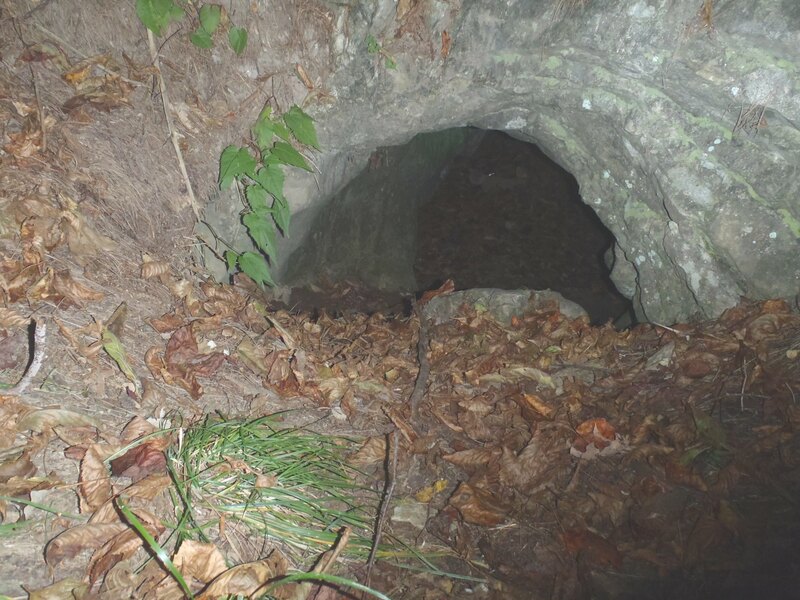 Conversations with long-time town and county residents turned up very little information about the alleged cave… quite the different response when compared to previous cave inquiries. Interestingly enough, while many town residents swore via third hand “knowledge” that a cave ran under the town (allegedly from somewhere past the East End Cemetery all the way to the location of the old courthouse (no longer extant)) they almost universally expressed surprise that a cave existed under the restaurant. While few seemed to know anything of a cave beneath the restaurant, those who did claim to know something (typically the very oldest of those queried) generally seemed to agree in many respects, which I took as a good sign. What little I learned was that the original structure of the restaurant was built circa 1776 – long before even the county was incorporated in 1789 and long before the existence of the town, when the area was decidedly frontier. The story went that the cabin was built atop a small cave that was to be used as a hiding place or escape route in case of Indian attack. Additional information indicated the cave ran from the restaurant, under Main St., and exited through a second entrance located a few blocks away. Beyond that, little was known. Eventually curiosity overcame my laziness and I turned to my favorite sources: Douglas, Holsinger, and the VSS. (Being the county director does have some perks.) Douglas, as expected was exceedingly vague: “Log Cabin Cave is located at the Log Cabin Restaurant on Rt. 11 E. of Wytheville. –E Thierry.” Yeah. I already knew that. (In fairness though, Thierry doesn’t say he entered the cave, nor even viewed it. He only reported what he was told.) Holsinger was a bust. The VSS county records were only marginally better than Douglas; those records start with Earl Thierry’s 1949 report which is only slightly less verbose than Douglas’ description. They end disappointingly. “When the Log Cabin was last remodeled the old chimney was torn down and the bricks thrown into the cave with the trapdoor being removed. […] The second entrance was sealed shut by the town.” Not willing to blindly accept this, I forged ahead, starting my own search with the current owner of the “1776 Log House Restaurant”, Mr. James Green. I met with Mr. Green on Feb. 3, 2016 and was pleased to learn that he was more than willing to talk about the restaurant and the cave beneath. Mr. Green’s account* of the restaurant and cave begins around 1770 when a Revolutionary War veteran named “Will” (“Will somebody; I can’t recall his last name” – James Green) acquired a small land grant from a Stuart Campbell. “Will” built a two room cabin on what is now Main St. The layout was one room up, and one room downstairs, with a chimney on the north-eastern end of the cabin. The original front of the building faced towards what is now East Monroe St. Eventually, the house was acquired by the Chadwell family sometime prior to the Civil War. According to Mr. Green, Abby Chadwell (mistress of the house) hid and treated wounded Civil War soldiers in the cave beneath the cabin. I assume these would have soldiers wounded in the so-called “battle of Wytheville”, better known as “Toland’s raid.” (July 18, 1863 – elements of the 34th Ohio volunteers under the command of Col. John Toland entered Wytheville while attempting to destroy area railroad track, telegraph lines and the nearby lead mines. Citizens and the local militia engaged the Union troops in the streets of Wytheville, killing Toland and several of his troops before withdrawing. Union troops burned portions of the town in retaliation.) After the war the structure passed to the Rosenheim family, then to the Robinsons, and ultimately it became the location of the Rich Brothers furniture shop before passing to the Cook family. According to Mr. Green, the structure remained vacant for 8 to 10 years before the Cook family acquired the property with the intention of tearing down the cabin to build a dry cleaners shop on the property. Instead, the Cooks also acquired the property across the street and established their dry cleaning business where it now stands at 545 E. Main St. Mr. Green acquired the property in 1976. He said when he acquired it, the entire structure was covered practically to the roof with vines and was in generally poor repair. At various times in the structure’s history additions were built in several directions, primarily to the north-east and the northwest sides (the original front and chimney side.) The original structure can, however, still be easily discerned. In the photo below it is the section outlined in red. The blue arrow indicates the original (and extant) north-eastern exterior wall while the blue rectangle indicates a filled-in-but-original window casing. The central chimney is located approximately where the original chimney stood. During our conversation Mr. Green admitted he’d never been in the cave, but had heard there was a cave beneath the original house. He further related how, a few years after opening the restaurant a very old man family stopped in and told of growing up the house; he was one of the Rosenheim children. Mr. Rosenheim told Mr. Green that as a child he and his siblings frequently played in the cave; it ran under Main St. and was accessed through a trapdoor inside a closet. When Mr. Green acquired the property he said it already had the current chimney and that the original floor had been replaced. He did, however, show me the location of where a closet existed at the time of his acquisition. The closet extended from the original front exterior wall and clear to the left of the fireplace. Currently, that space is occupied by a dining booth. Clearly any trapdoor that may have existed was lost when the building was renovated sometime in the not too distant past. Perhaps evidence of the cave still existed beneath the building, however. Mr. Green graciously offered us access to the crawl space. Myself and grotto members Jason Lachniet, Zach Taylor, and Eric Cueva met a few days later to go see what we could see.The crawl space is entered by descending a set of stairs into a more recent sump area beneath a later addition and then climbing up over some pipes and through a hole in what was/is the original structure’s foundation..
After crawling beneath the original structure, there was nothing immediately evident of the cave, nor even of the rubble pile that remained of the original chimney allegedly used to fill the cave entrance. (Remember, reports were that the original chimney had been pulled down and the rubble thrown into the cave entrance.) An old mix pile immediately in front of the chimney seemed to indicate where perhaps the masons stood and worked from and mixed their mortar and some various fragments of very old crumbly brick were scattered atop the dirt. A view of the chimney base looking from the southwest towards the northeast. Presuming the closet Mr. Green reported was the same one containing the trapdoor, the cave should be to the immediate left of the chimney. Note the old mix pile immediately in front of the chimney. The mix pile, seen from the side where the cave should have been. I began by digging a test pit to the left of the chimney (under said booth/closet)in hopes of finding the top of a rubble pile. Surely something as large as a two-story chimney would have a sizable amount of rubble, one would think…right? No joy. I dug a test pit perhaps a foot deep and a couple feet in diameter beneath the location Mr. Green indicated the closet stood but found no evidence of brick rubble beyond an occasional small fragment. Likewise, a test pit was dug on the other side of the chimney with similar results. An examination of the current chimney’s foundation does reveal in interesting detail however: a square void, filled in with older bricks, mostly fragmentary in nature. Zach, shovels in the foreground. A close-up the filled-in void on the chimney’s foundation. Assuming the cave existed, I can only guess that perhaps the original chimney’s rubble was cast into the cave’s entrance and was used as the basis for the current chimney’s foundation. Regardless, no trace of the cave nor of any rubble pile remains under the original structure of the 1776 Log House Restaurant as of 2016. In retrospect, the only other possibility might be the mix pile: it could be sitting atop an even larger pile of old brick rubble. If so, it would take a major effort to dig it back open. So what about the second entrance – the one “sealed shut by the Town”? Certainly, Wytheville has changed since Earl Thierry’s time, and even more since the cave’s second entrance was still open. At that time, the second entrance was in a vacant lot “on a street corner.” Pulling from a variety of sources – oral traditional, old grotto newsletters and correspondence, plotting and comparison of competing sets of unreliable UTM coordinates, etc., the likely entrance that was sealed by the town lies in a vacant lot near a local church. Speaking of UTM coordinates, the vast majority of those coordinates were gained by comparing them to know geographic features and/or scaling them off of 15 minute maps and are thus notoriously inaccurate. Modern GPS’s show cave locations to be several hundred yards off from the originally-reported locations in many instances. In the case of Log Cabin Cave, two different sets of unreliable coordinates exist. One set had the log house’s entrance located under what’s actually the local Catholic Church, clearly demonstrating the degree of error one encounters. Still, starting there (we have to start somewhere, right) and plotting the second entrance, as well as doing teh same with teh second set of coordinates effectively gives me two parallel lines running northeast to southwest and separated by about two blocks. Using that to determine a general direction of the cave’s passage, going off of very vague and old descriptions, and looking at the lay of the land helps us further determine the second entrance as well as to loosely locate the cave as being beneath the NAPA auto parts store sits. Kind of backing that up, the owner of the NAPA auto parts store has told me that the smell of gasoline seems to come up through the floor during particularly heavy rains. Coming full circle, there’s plenty of anecdotal evidence of the existence of Log Cabin Cave, but it’s clear that the cave exists now only in the town’s history. Fitting, I guess, since this trip report turned out to be more of a history lesson than a cave report. June 5, 2015 saw grotto members Bill Grose and Tanya McLaughlin and VPI friend Amy Skowronski spend a karst-y kind of day in Wythe County. 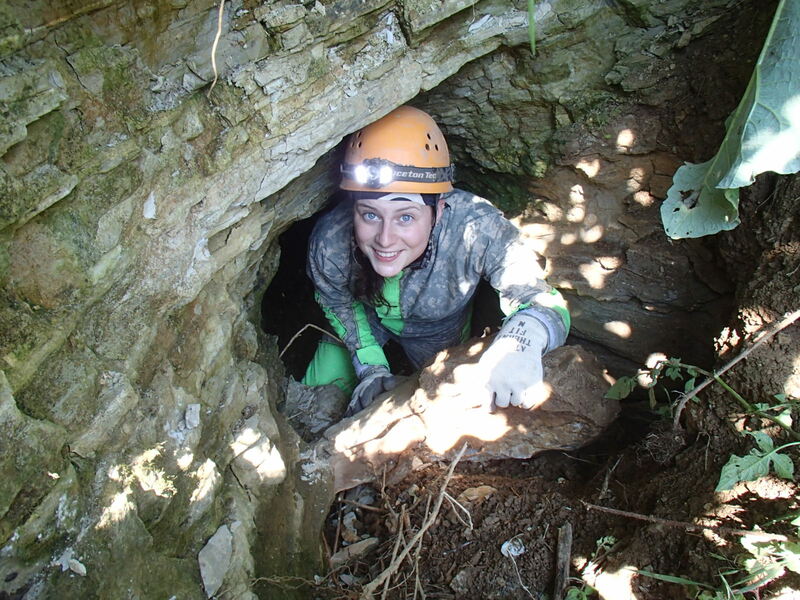 The day started with a trip into Saw Smith’s Cave for what was hoped would be a fast survey. VSS reports put it less than a hundred feet. Fast doesn’t come close! All three of us made in into the tiny cave for the first 30 feet. A small worm hole at floor level proved too small for Bill and Tanya. Amy squeezed through, did a quick sketch with the commentary, “there’s more beneath me!” Skinny cavers will need to finish this. Emma? Hunter? Amy? Bueller? Bueller? Amy, at the entrance to Saw Smith; through the worm hole! Following the semi-abortive trip into Saw Smith, ill, Tanya, and Amy heading up into Smith Hollow to examine and document a cave opening. I suspect the cave is the old Bowles Spring Cave, but if so, it has been heavily modified. June 25, 2015 was the grotto’s annual cookout, held in lieu of the June meeting. 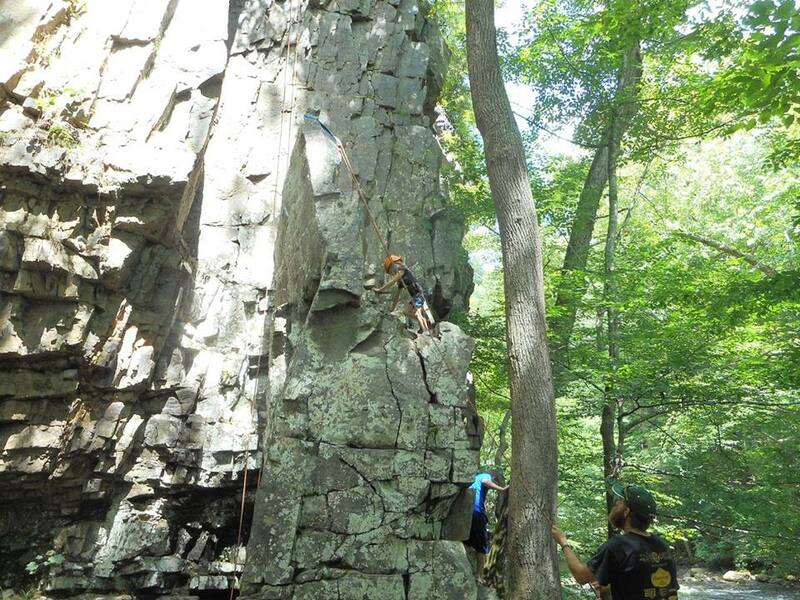 I won’t go so far as to say it was a bust, but aside from the Lachniet clan, Bill and Wendy Grose, plus MEG friend Wes Combs and companion, it was a quite day spent at Backbone Rock climbing, rope practice, and cooking out. July 19, 2015 brought another two cave trip. 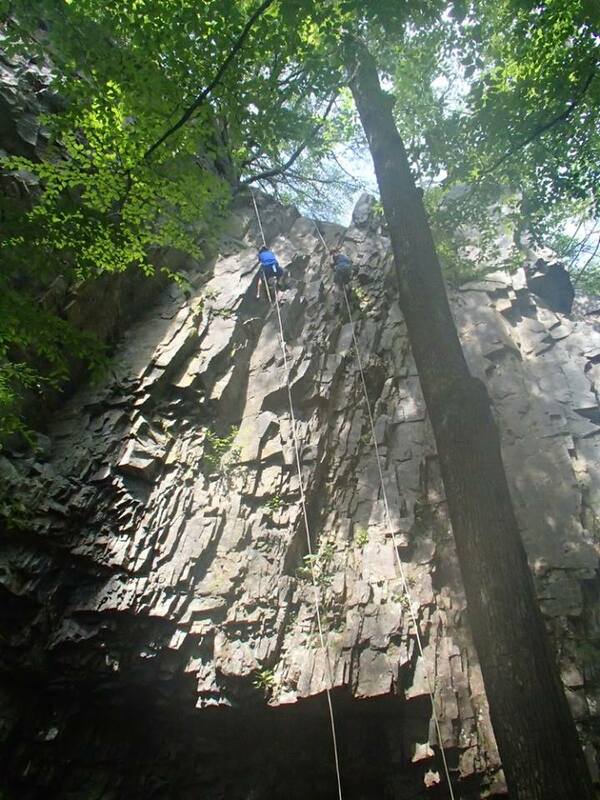 Grotto members Bill Grose, Zachary Taylor, and Cindy Baubach led a sport trip into Sam Six. Guests included Nate Montgomery and his two boys, Aslan and Oscar. Zachary took over as guide mid-trip so Bill and Cindy could do some minor mopping up of the Sam Six survey. We’re happy to report that the Sam Six resurvey is complete and a current and accurate map is on the drafting table as we speak. Almost 400 feet were added to the map, bringing the total to 1670 feet and a depth of 51 feet. Well done! 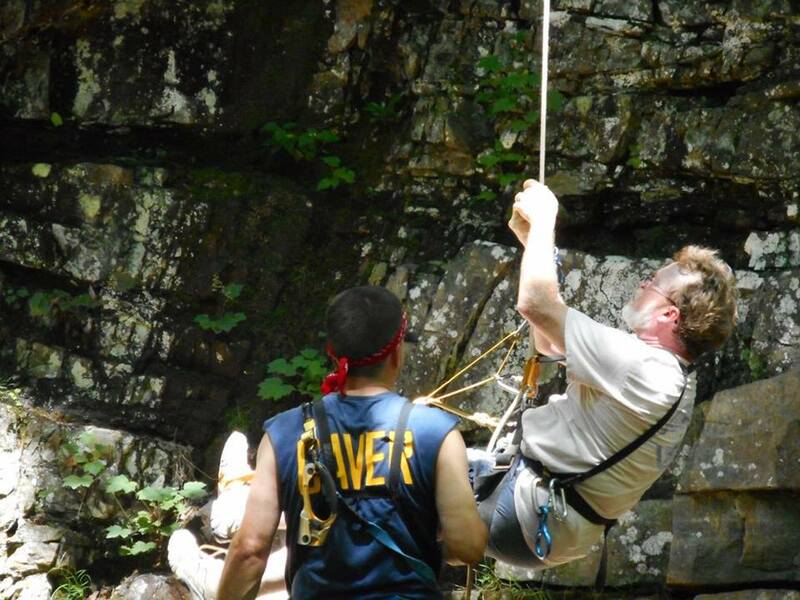 July 24, 2015 saw Grotto members Bill Grose and Emma Buchanan lead a sport trip into Tawney’s Cave. Guests were Bill’s friend Matt K and his four children, ages 5 to 11. The trip went quite well, with only a tiny bit of drama at the end of the trip: An exiting scout group re-locked the gate and our team arrived at the gate a couple hours later only to discover the lock the Scouts used was the stubbornly rusted lock. We were effectively stuck! (Or so it seemed.) Emma squeezed through and headed for the Bat Ranch to fetch a can of WD40. After nearly 20 minutes of cussing and fussing, Bill managed to force the lock and open the gate. 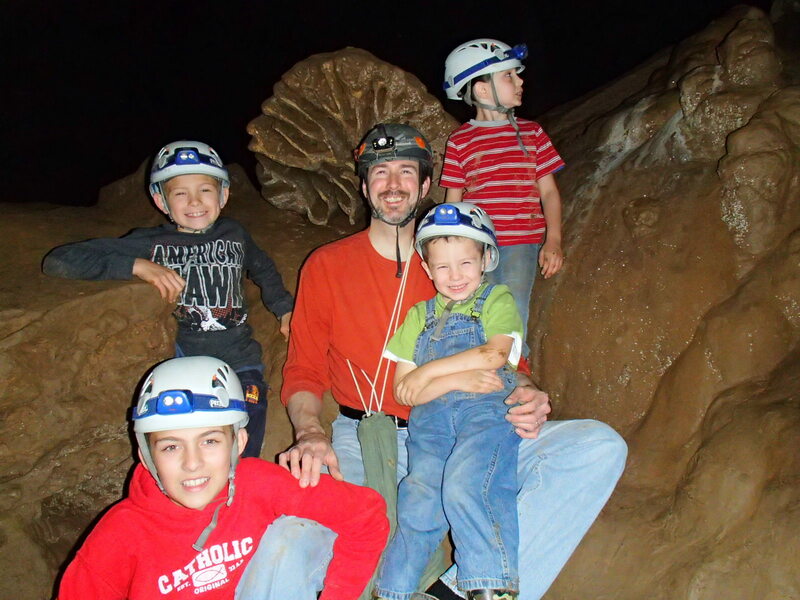 Matt K and family – intrepid cavers! September brought OTR. 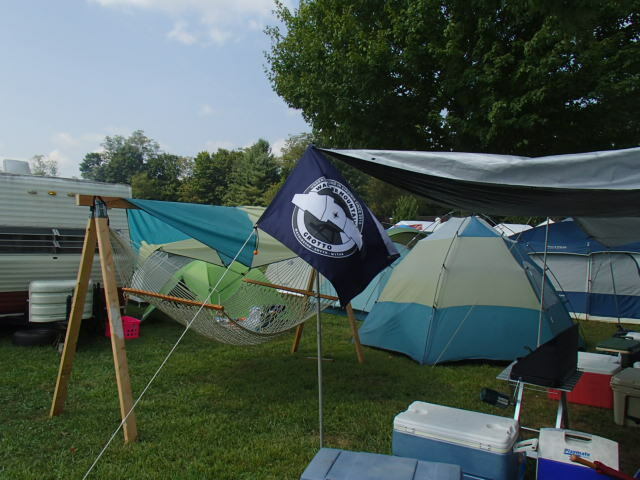 WMG was represented at OTR by Bill Grose (camped with New River Grotto) and Janet Manning camped with Flittermouse Grotto. A good time was had by all. 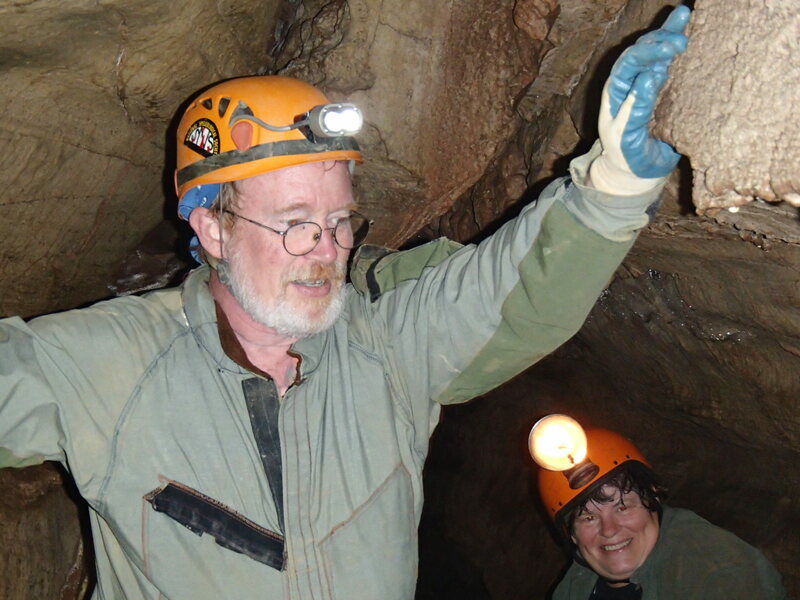 Bill Grose managed to join a “gimp trip” to Nelson Cave, while Janet and Cindy caved their little fannies off -Stillhouse Cave, Sinks of Gandy, and Yahoo Hollow Cave. 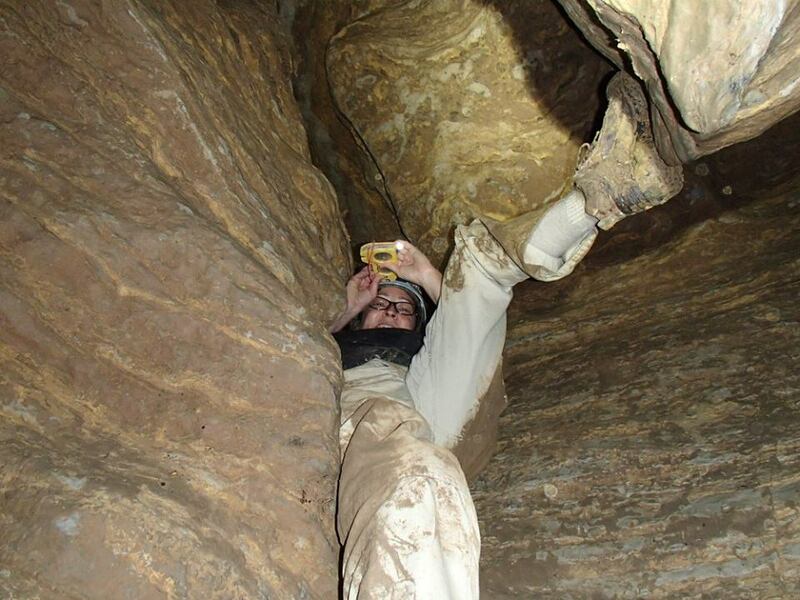 Somewhere in between all of this, Jason managed to squeeze in a couple survey trips to mop up an old unfinished VPI survey into an unidentified (due to a sensitive name) cave in the Glade Spring area. He also completed a dye trace, connecting three area caves (again, not named here), and led a Scout trip into yet another a small cave. I believe he mentioned more, but it’s late and my brain is tired and I can’t recall it all. (I’m doing well to recall all what’s in this post!) We’ll let Jason fill in details and make corrections as he sees fit. The 2015 Spring VAR was held at the Caverns at Natural Bridge. BATS (Battlefield Area Troglodyte Society) April 24-6, 2015. Grotto members attending this year were Emma Buchanan, Bill Grose, 4/5s of the Lachniet clan (Jason and the girls), Tanya McLaughlin, Zachary Taylor, and Hunter Wyatt. Becca Branscome was registered, but unfortunately had to bow out due to illness. We missed you, Becca; get well soon. BATS did an excellent job. A good flat and easily-accessible area for camping was available (as was ice), and a band for Saturday night’s entertainment were provided, as was a coupon for a steeply discounted combination ticket to the Caverns and to Natural Bridge. Quite a few trips to local caves were organized for Saturday and vendors IMO and Speleobooks were present with some great deals on books, tchotchkes, and caving gear. Dinner for Saturday night consisted of hamburgers and hotdogs with all the fixin’s, side dishes, dessert and drinks, and was, in my opinion, pretty good – no pinkies or scab-burgers! Supper was followed with a presentation by Ernst Kastning – a slide show titled Natural Bridge of Virginia: A Brief History, From the 1750s to the Present, to accompany his new book. Following the conclusion of his presentation, door prizes were awarded and then everyone headed back to the camp site for live music provided by a local band. 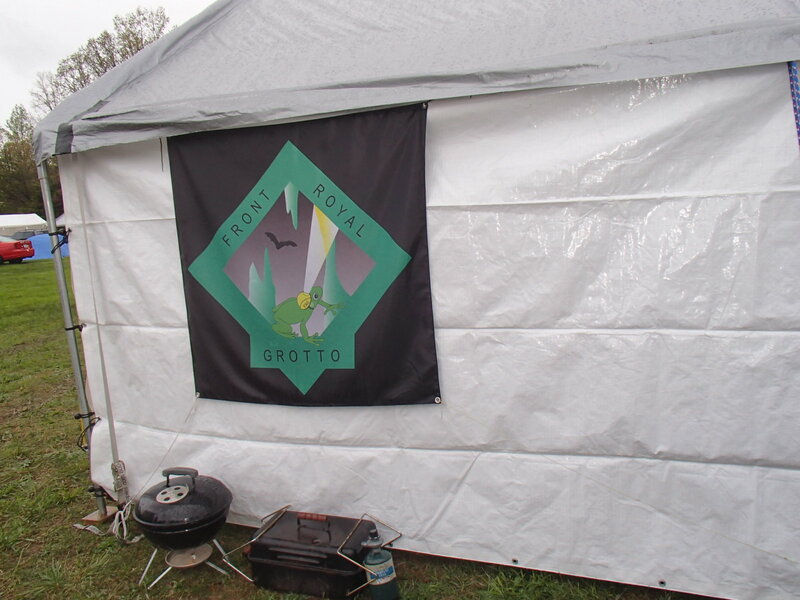 Rounding things out, Front Royal Grotto provided their usual pancake breakfast on Sunday morning. Om nom nom. 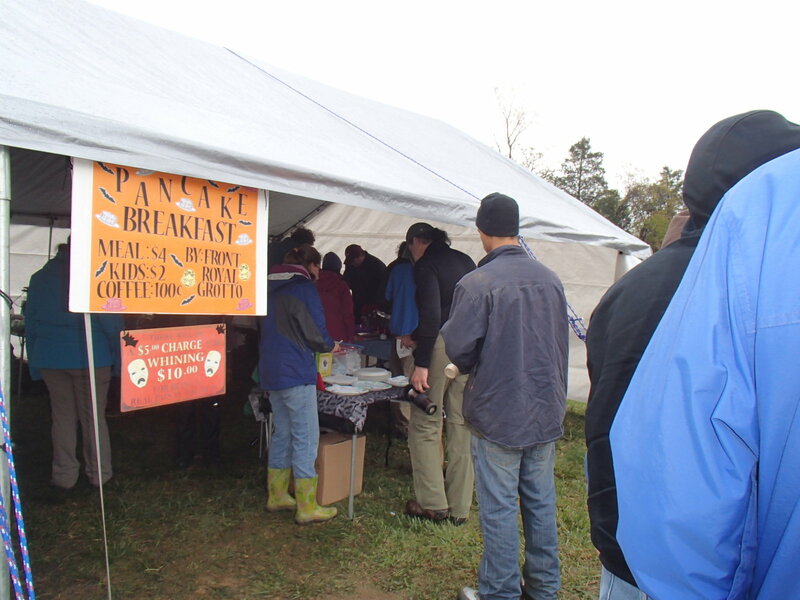 With a little over 300 cavers in attendance, BATS did a great job of managing the food service, camping, and entertainment – Kudos to BATS. About the only downside to this year’s Spring VAR was rain – lots of it. Even then, it seemed everyone had a good time. For WMG, the high point was being voted into VAR as an official member. Thank goodness for our flag! 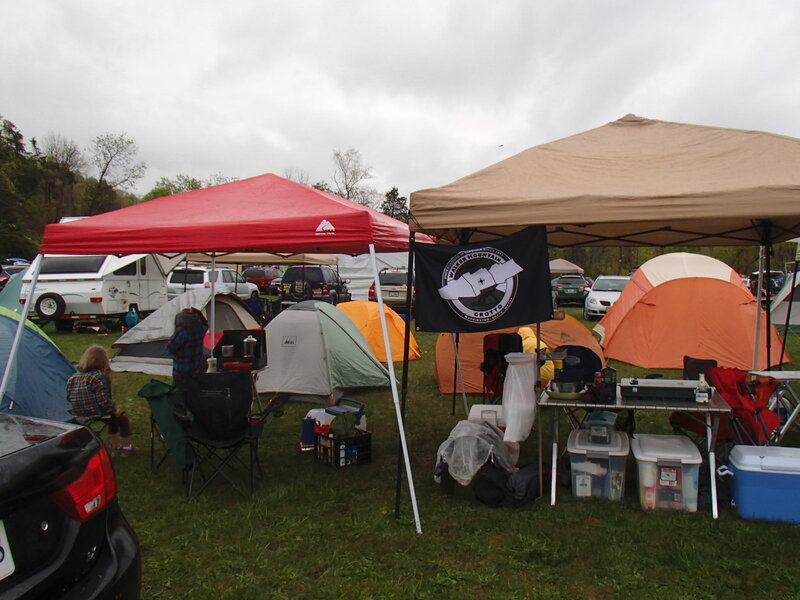 WMG’s camp site, right beside our friends from the Tri-Trogs. Sunday breakfast made easy, courtesy of the Front Royal Grotto. 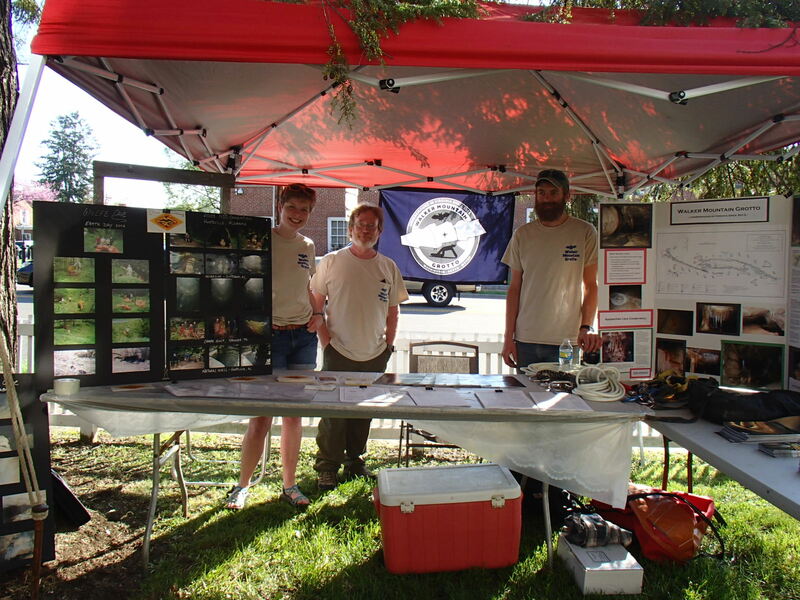 The grotto put in an appearance at Abingdon’s Earth Day April 18, 2015 at the Fields-Penn House. Plans were to set up a display and do some vertical demonstrations.Grotto members in attendance were Steve Ahn, Emma Buchanan, Bill Grose, Jason Lachniet (followed by Emily and and the girls), and Tanya McLaughlin. MEG cousin Bill James shared space with us. Emma, Bill, and Jason man the booth; Emma and Jason fielding questions from a visitor. Although our plans for vertical demonstrations didn’t pan out (due to a combination of last year’s location being unavailable and this year’s location having a suitable tree) we had a great time. Plenty of visitors stopped by with all sorts of questions, comments, and, suggestions. One of the high points was spending time with a gentleman who was part of the original Perkins Cave survey teams that generated the 1974 map! Additionally, the grotto voted to hold a monthly sport trip, scheduled to occur on the Saturday immediately following our monthly meeting. That means this month’s sport trip is scheduled for Saturday, January 24, 2015. We’ll be going to a cave near Marion that is an easy, family-friendly cave. Plan on about a three hour trip (give or take.) Check your email for particulars about meeting location and time. Next month’s sport trip is tentatively scheduled to coincide with the annual bat count at Hancock Cave. A few days after the CoV-SAR class the class and the grotto made the local newspapers, and a day or so after that I received a call from a lady who lives in the Crockett’s Cove area of Wythe County. Listening to her description and address, I cross-referenced Douglas’ Caves of Virginia and Holsinger’s Bulletin 85, and a touch of GoogleEarth, and wondered if this could be Julia Crockett’s Cave. The general location and the description seemed to match. Judy S., the landowner, called to say she had a cave on her property and would we (i.e., the Grotto) be willing to “come take a look at it?” Is the Pope a Catholic? Of course we’d be delighted! A few quick emails and phone calls, and Jason and I decided we’d ride out to her place the following day, after we got off from work. Tuesday afternoon (Sept. 30) couldn’t come fast enough. Jason met me at my house and we rode out together. Once on site, Judy S. and her husband Jerry S. met us and took us to the cave’s mouth…all of 50 feet from their house. 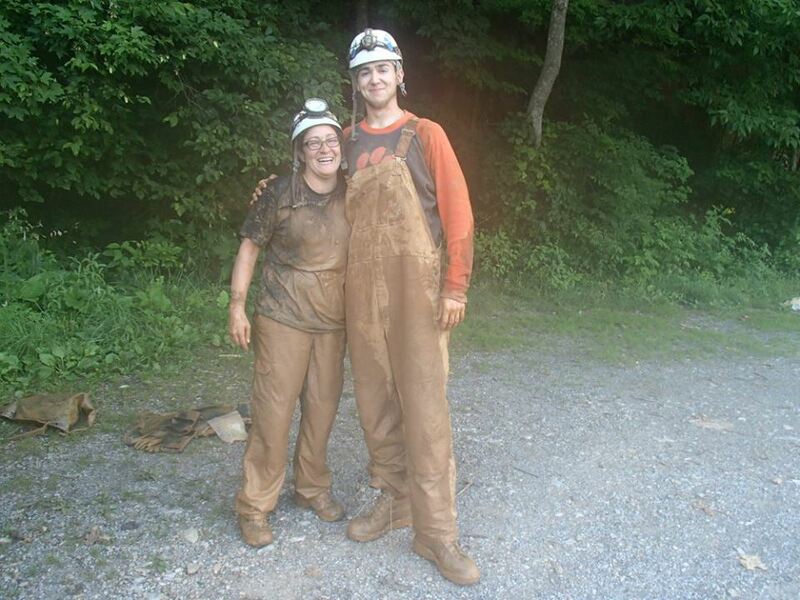 Jason and I took a few shots with our GPS’s and queried the landowners to see what they knew about the cave. If this really was Julia Crockett’s Cave, our lat/long differed from Douglas’ lat/long. However, circumstantial evidence does seem to bear this out as being Julia Crockett’s Cave. According to Jerry S. the land had belonged to his grandfather “[who] was a Crockett.” Likewise, the general location description (“on the crest of a bluff”) and the elevation did match Douglas. The entrance is indeed on the crest of a hill. The mouth is a rectangular hole in the side of small but noticeable sinkhole, perhaps 6 or 8 feet wide by 15 feet long. It helps make it more noticeable that a flower bed has been established around the sink hole! Judy S.’s description was a vertical pit (“I’ve thrown rocks down in it and sometimes I hear water splash but other times it takes a couple minutes before I hear the rocks hit the bottom.”); a quick peek initially seemed to confirm it. Jason rigged the hole with some webbing and went in. I followed a few seconds later. The cave descends sharply, and while a handline makes things easier, it’s by no means a vertical cave. The cave is generally one big room, and “cave” is a questionable description since there was no area of complete and total darkness. It’s not quite a cave under a strict definition, but it’s not really a pit either; more on this in a second, though … From the lowest point at the floor to the mouth of the cave, it’s perhaps 35 feet. I base this estimate on a 30 foot piece of webbing: a good 10-15 feet rigged around a tree above ground, and another 10-15 from the floor to the bottom of the webbing. The cave had a few broken formations but not much to look at. The floor was choked with many years worth of trash in the form of broken glass, thousands of tin cans, old toys and shoes, a lawn chair, large rocks, and much alluvial dirt. Apparently the cave was used as a trash pit for many years, something not uncommon in rural areas. The floor was not packed solid though, and in places it seemed as if one could look through the detritus and rocks to voids beyond. Jason and I dug around and moved some trash, but weren’t able to determine if there was passage. I’d guess there was close to a truckload of trash that would have to be removed in order to see if there was anything more to the cave. On the other hand, Jerry S. reports that the cave “blows steam” on cold days. Jason and I exited the cave, and with Jerry and Judy S’s permission we checked out another sink and scoped out the property. A flock of turkeys milled about down by the creek, but little else of interest was seen. 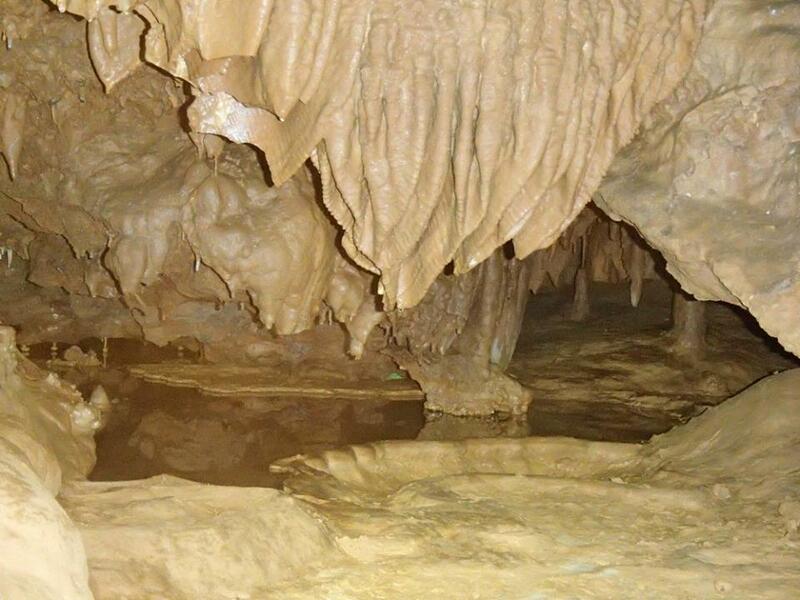 Jerry S. did, however, tell us of a few other nearby caves! Jason and I left, confident that Jerry and Judy S.’s cave is in fact Julia Crockett’s Cave. 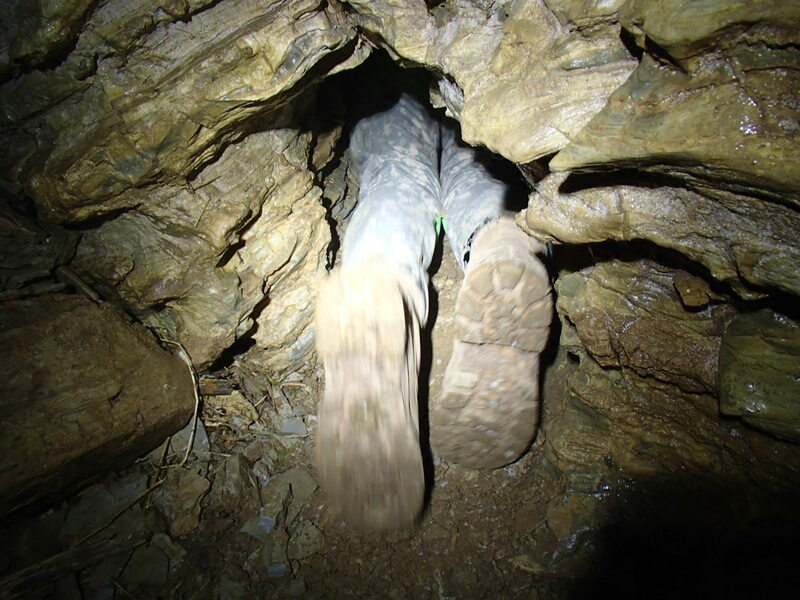 We headed up the hollow to investigate reports of another cave or two. 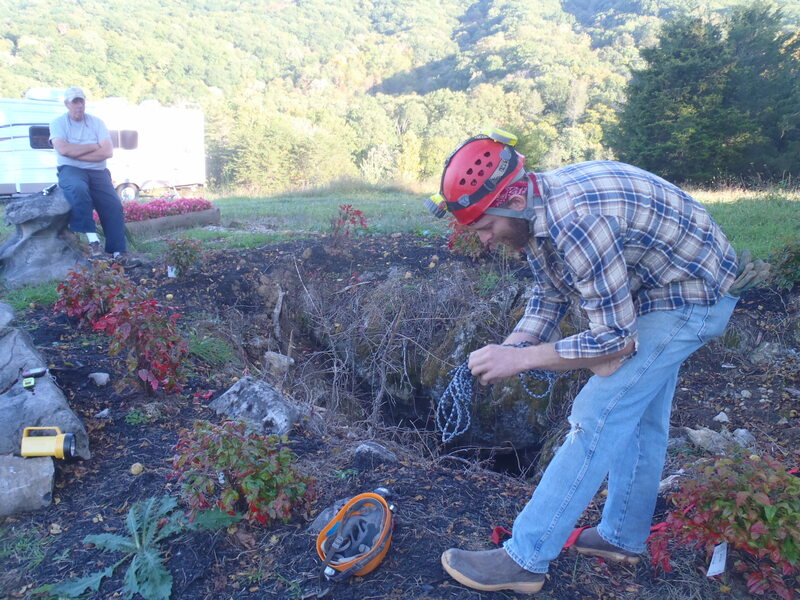 Julia Crockett’s Cave (aka Julia Crockett’s Trash Pit); Jason rigging the pit as landowner Jerry S. looks on. small roadside cave, up in Smith Hollow. I feel confident we have discovered the location to Wytheville Cave. I went out with a GPS and using Douglas’ lat/long found nothing more than a bumper crop of Toxicodendron radicans. I did, however, find out who owned the land where Wytheville Cave is located, and in the process, located another cave (somewhat removed from Wytheville Cave.) After speaking with of the local folks, I got some more info on where Wytheville Cave might be, and a day later, Alec and I went looking again. This time, however, I feel very confident that we found it. Unfortunately, it looks like it has been filled in with large rocks some years prior. On the other hand, it appears that it wouldn’t be too difficult to peel back a few rocks and drop in for a quick look sometime in the near future. That said, all three of these caves, with current up-to-date landowner info was reported to the VSS. 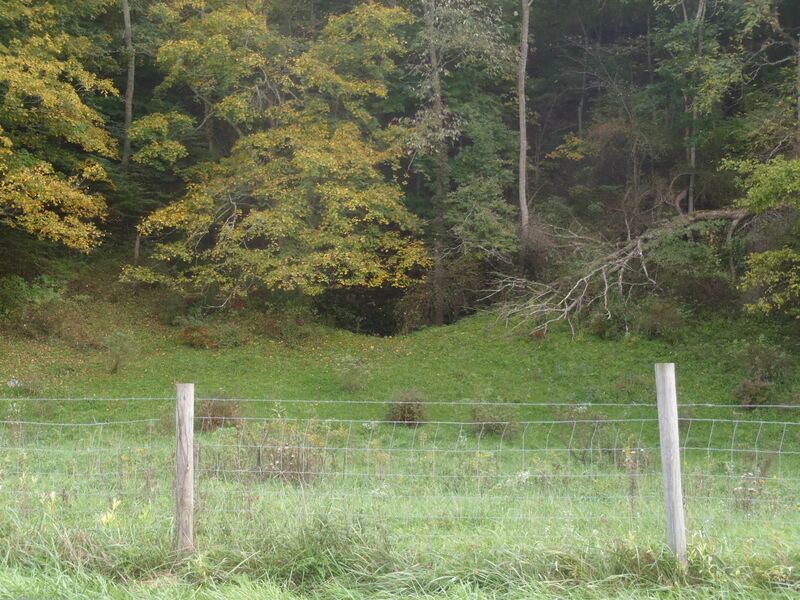 A fenced sinkhole is clearly visible in the middle of a field on the way to Julia Crockett’s Cave. A little time on GoogleEarth, the Wythe County GIS system, and the Wythe County courthouse turned up not only the landowner’s name, but also resulted in the Grotto receving permission to visit the cave at-will. Score 1 for the Walker Mountain Grotto! According to Douglas’ lat/long, this cave is Saw Smith’s Cave. The landowner, Mrs. D. confirmed this: “Saw Smith was my father.” According to Mrs. D., a calf fell in to the sinkhole and got trapped on a ledge. After freeing the calf, the hole was fenced. Mrs D. further said that while folks used to visit the cave “at least once a year”, no one has visited, to her knowledge, in some years. Neither Douglas nor Holsinger give any information about Saw Smith’s Cave. Hopefully the VSS has a description and knows whether or not a map exists. While seeking out Wytheville Cave I spoke with someone whom I thought was the landowner. (It turns out Wytheville Cave is on an adjoining plat.) 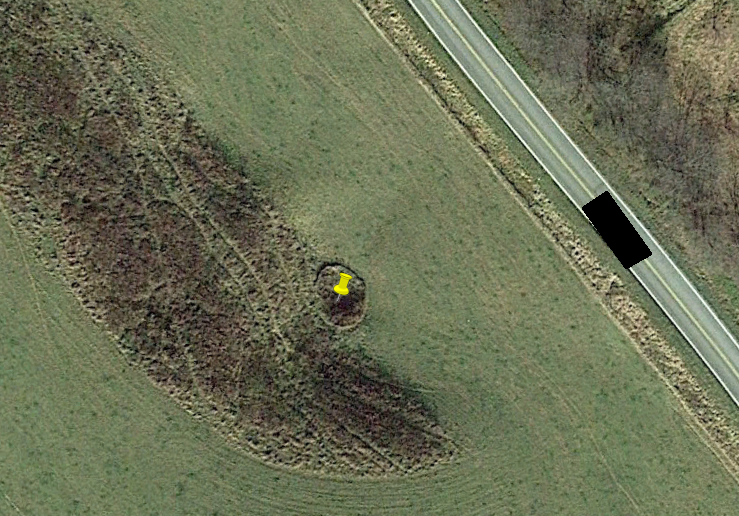 Dale C. gave me permission to search for Wytheville Cave on his property and even go in it if I found it. 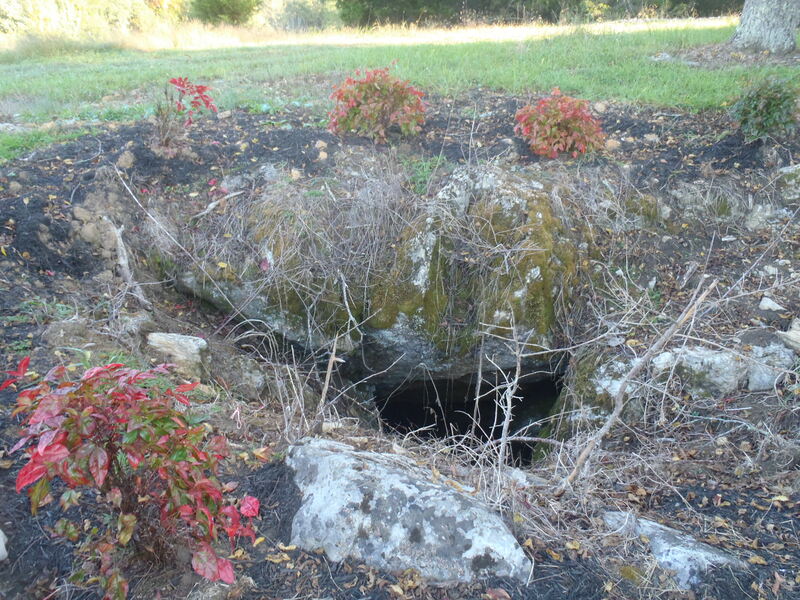 Dale C. said he had no knowledge of a cave on that piece of property. He did, however, say he not only knew of, but owned a cave elsewhere in the county and gave us permission to visit it at any time. (Score #2!) He called his uncle, James P. who lives on the land and told him I’d be coming out forthwith. James P. took me to the cave, and gave a description of it; apparently he’s been in it many, many times. His description matches the map of this cave that’s in Douglas. 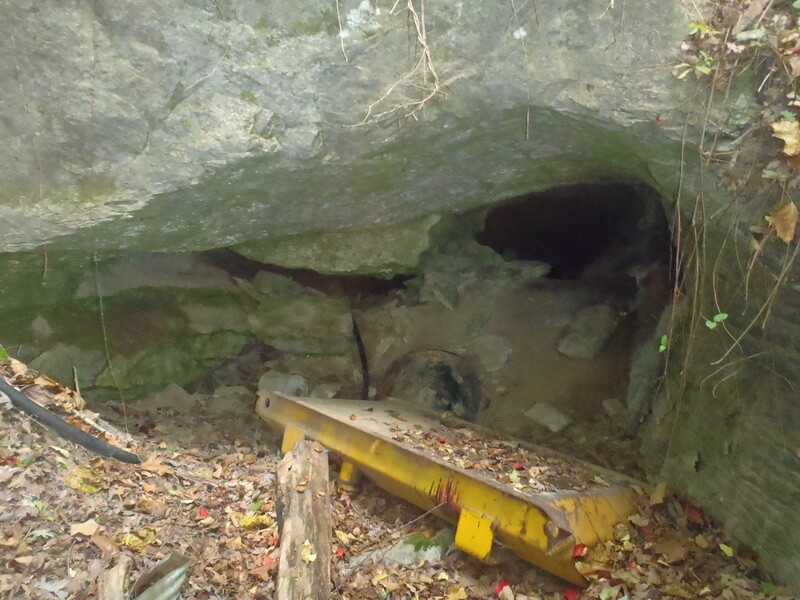 The cave is known as Sam Six Cave and is one of the longer Wythe County caves. James P. repeated what his nephew, Dale C. said: the Walker Mountain Grotto was welcomed to visit Sam Six Cave any time we want. Douglas has a map of this cave, but it’s a poor one (typical of the 1950s/1960s maps: minimal details.) The cave has been relatively heavily visited over the years so it’s possible a newer, up-to-date map exists. Of course, if VSS doesn’t have a quality map, no doubt the Grotto may may take this on as a project. Sam Six Cave. The yellow object is a bulldozer fuel tank. James P. graciously took me riding through part of the county, and showed me another sizable cave. 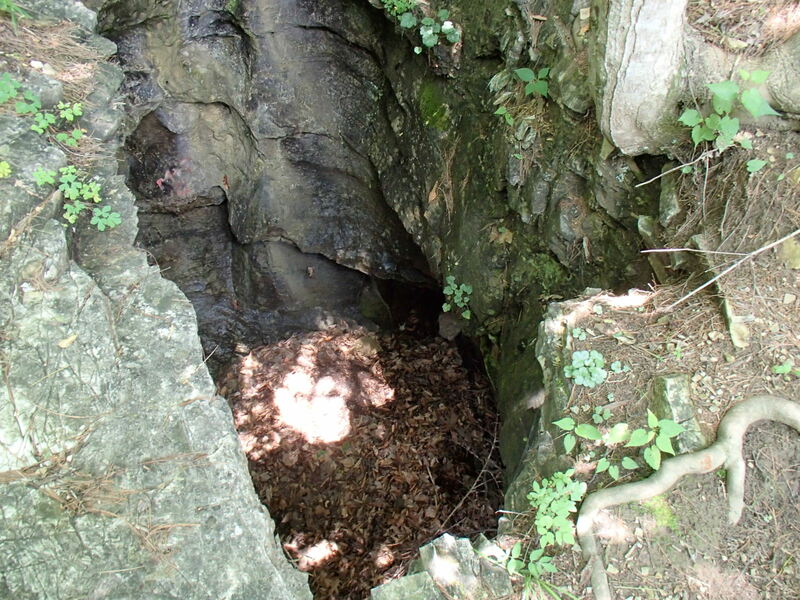 He called it “Schoolhouse Cave” but others, including Douglas, refer to it variously as Cave School Cave, Cave School Water Cave, and Hetrick’s Store Cave. Again, a trip to the courthouse verified the landowner, and while I’ve got two calls in to him, to date I haven’t spoken with him. Douglas contains a brief description dating to 1949: “approximately 120 feet long with some deep pools.” A neighbor of the landowner said she remembers, as a child, “ducks going into it and coming out in a spring [on the other side of the hill. 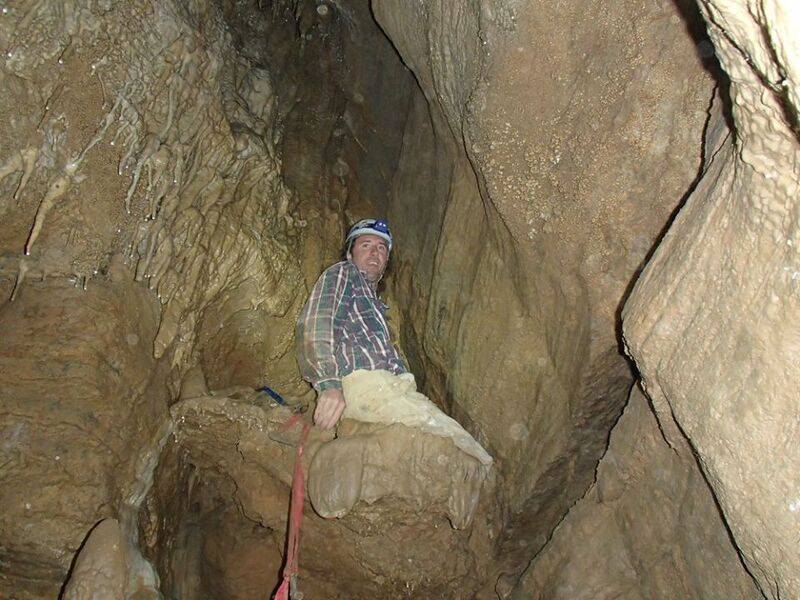 ]” If it matters, I heard the same story repeated by two different people about Speedwell Cave! 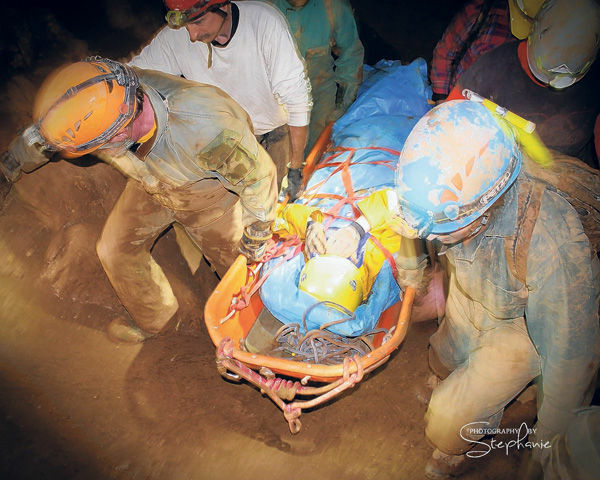 It’s dark and dank and dangerous, but somebody’s got to do it: rescue people stuck or lost in caves. 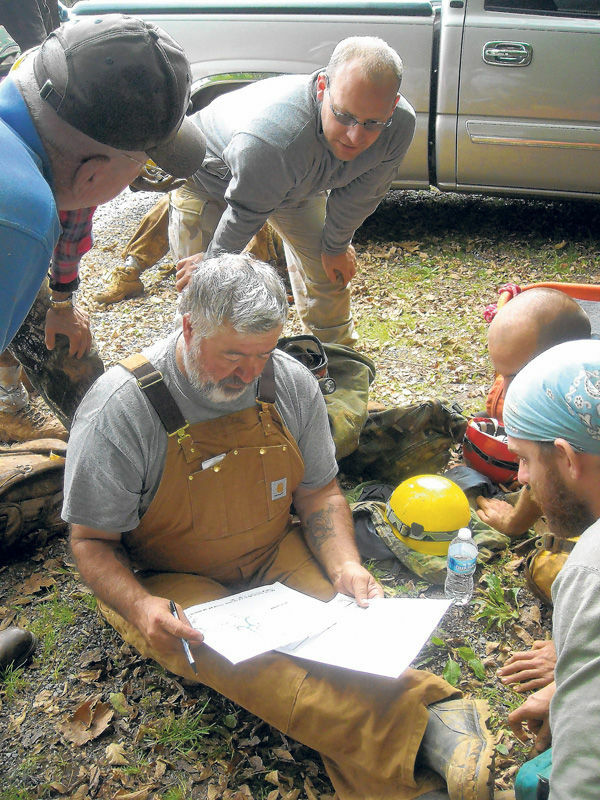 A group of local first responders, along with area cavers, recently practiced doing just that during a weekend training exercise in Speedwell.